This is a project I have always wanted to try. From everything I have read it is pretty easy. And the best part is, I get to control what goes into the lip balm. Say goodbye to petroleum based ingredients. Goodbye to synthetic dyes. Goodbye to parabens and other preservatives. 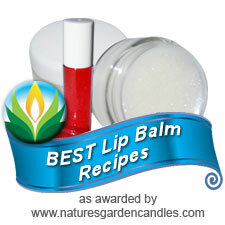 There are so many recipes available that before I chose one I decided to do a little investigating into the basic structure or chemical make up of lip balm to find out the propose of each ingredient. The basic structure of lip balm comes from a waxy solid. In commercial products this may come from petroleum, various types of wax, or polyethylene. In my home made recipe I will use beeswax in combination with coconut oil which is solid at room temperature. Commercial products also contain a combination of conditioners, humectants, and emollients which are basically things to soften and moisten your lips. These ingredients also soften the product since the waxy bases tend to be very hard at room temperature. Pretty much all of the commercial ingredients are things I cannot spell so I won't try to write them out here. For my homemade recipe I will use almond oil and the coconut oil for this purpose. You could use Shea butter and or cacao butter as well. If you were adventurous you could try palm oil too. Finally commercial lip balms contain flavorings, fragrance and preservatives. My homemade recipe will use essential oils for for the fragrance. The ingredients themselves provide the flavoring although honey can be added for sweetness. Both coconut oil and honey will provide some preservative function to lip balm. Once soft, mix together well then add the essential oil. I chose to try grapefruit oil. Now to just figure out how to make cute little labels for the tins. Oh Heidi it was so much simpler than I thought. And, it only took a few minutes. Very much a win win for me! I recently started making homemade lip balm and it is wonderful. I like to add peppermint essential oil for a little tingle. It is so easy and inexpensive, and I can actually pronounce the ingredients! I did this not long ago and agree with Rene. Peppermint EO is a great addition and I also added lavender for soothing and healing properties! I am really looking forward to trying your homemade lip balm. In the winter time we go thru a lot of it and this recipe looks great. Thank you for sharing with the Clever Chicks Blog Hop this week; I hope you’ll join us again! I have a similar recipe I use and love them! I used baking extracts with great success. As far as labels, I found a Word template for circle labels, made my labels and printed on regular paper. Then used packing tape to secure, trimming the edges so it looks like a sticky label. Kristina that is a wonderful idea for the labels. I am going to give it a try! Thanks for the tip. We make our own lip balm as well only we use vegan ingredients. Thanks so much for sharing at Tuesdays with a Twist. Looking forward to seeing what you share this week! Thank you so much for participating in Thursdays @ The Homestead with Modern Homesteaders. We have enjoyed your article! Hope to see you again next Thursday! Yes, this is a good and simple one. I used to make one, and as things go, life gets simpler as time goes on, I am down to simply one ingredient, and that is pure shea butter I have scented with my favorite essential oil blend...but this one is good with beeswax which works so well. This looks so do-able! Thanks! You will find an excellent point in this blog post. Article author probably have really spent some time researching the subject. Blogging requires time and right after doing such job I enjoy viewing different makeup available as colored lip balm.